Spelling. Are you looking for Agenium, Habendum, or Veendum? What does agendum mean as a name of something? [obsolete] A task which ought to be done. 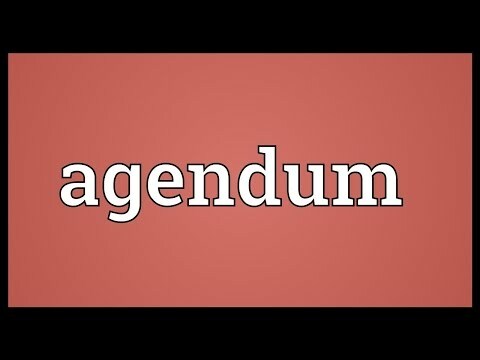 Agendum is a verbal noun, called a gerund, of the neuter gender and second declension : Sing. Nom. Hoc agendum, Gen. hujus agendi, Dat. huic agendo, etc. Agendum is the nominative case, coming before the verb est. The result then is an agendum for B. An agendum is a pair <a;p>where a is the action to be executed and p the period in which this execution has to take place. In the factagenic conversation, the result of the execution is stated by the supplier . In Latin, an agendum is an item on a list. Two or more items are agenda (neuter gender, plural). The singular agendum is purely notional, although it is occasionally used, e.g. in the context of academic bodies: The Estates Bursar was called on to introduce Agenda Item 3. They mean Agendum 3, thought Jake—Kingsley Amis, 1978.
" \il actum reputans, si quid superesset agendum. Lat. Luc an. The value of this 7-letter word is 11 points. It is included in the first and second editions of the Official Scrabble Players Dictionary. Go to the thesaurus of agendum to find many related words and phrases!